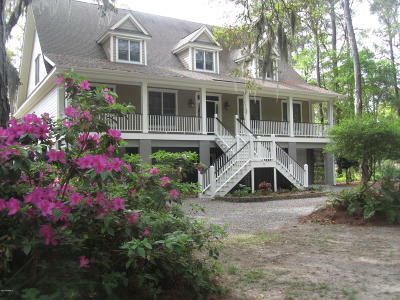 Large home located on the marsh with views of the Beaufort River in the distance. This home can accommodate a lot of people very comfortably. There are 3 levels. The bottom level hosts 3 garages plus a potting shed, hobby room, work shop, bath and a large play room large enough to accommodate a pool table. The main level has a Master Suite, guest room, office, hobby/bonus room, laundry room, great room, kitchen and 2.5 bathrooms. The top floor has a huge living area, two very large bedrooms and 2 full baths. The elevator goes from the bottom floor to the main floor. There is a front porch the width of the home but the best part is the screened back porch overlooking the marsh and tidal creek. This is where you will sit back and soak up the low country beauty.